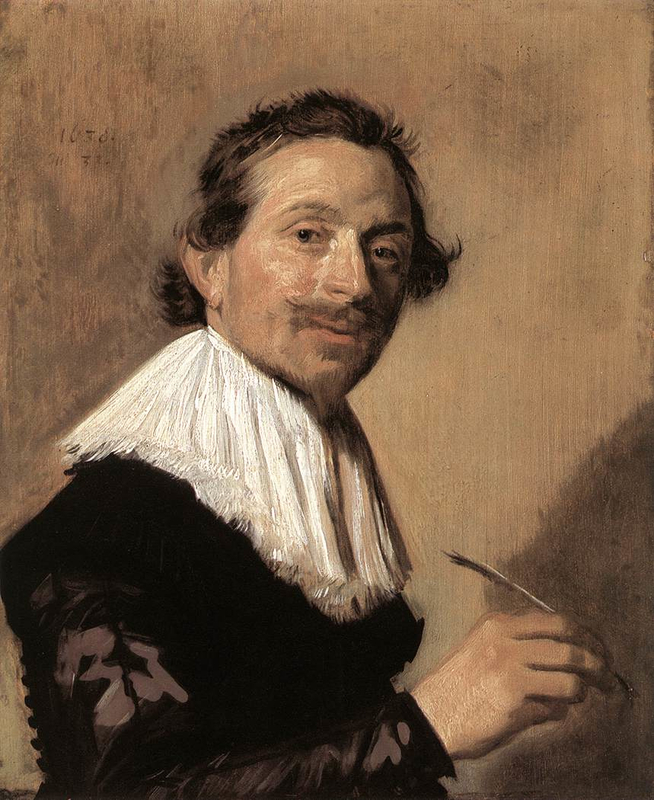 Quill in hand, Jean de la Chambre, a contemporary writer, is depicted by Frans Hals on the point of writing. Writing on what, though? And why is he looking at us? 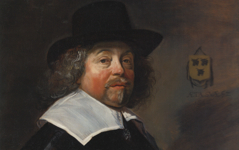 Yet if you know that every painter paints himself, Hals' strategy is clear. The sitter has become an artist, posed like a painter not a writer. Jean de la Chambre, a.k.a. 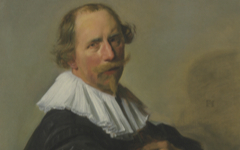 Frans Hals, looks out over his shoulder at his model, the artist himself in front of the canvas. 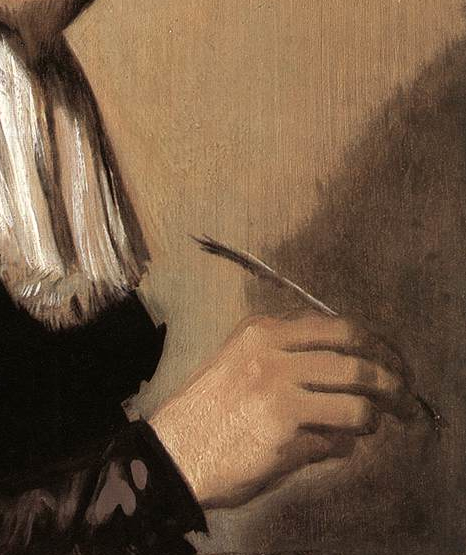 He holds his quill like an artist does his brush near a blank canvas. Perhaps he has already brushed in the shadow. Painters and writers have long used similar tools, especially when using paper. An artist's need, therefore, to symbolize the tools of their own craft with the tools of another is easier when the sitter is a writer. They can each become poets too. 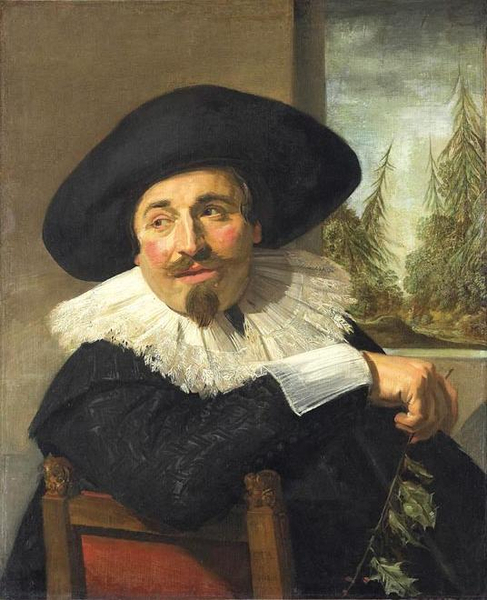 Perhaps that is why I immediately thought, on first seeing this portrait and not knowing the identity of the sitter, that he was a painter. He looks like one. The sitter here may obviously be an alter ego for the painter at work but only a viewer, like you and me, aware that every painter paints himself is likely to see it. To everyone else he will look like what the title and the museum says he is: a writer called Jean de la Chambre. Even Hals' most iconic pose, a man leaning on the back of a chair peering out of the canvas (as at left), can be seen in the same light: a "painter" looking out over his shoulder to check his model. It is painting's most iconic pose too and remarkably common in self-portraits. Here the window is his painting. Remember the various poses of a painter, including the glance over the shoulder, and you will recognize figures that you once thought were actors in a staged drama as the painter of that staged drama. It is a technique so little known in the art world that it works like magic. Original Publication Date on EPPH: 01 Feb 2012. © Simon Abrahams. Articles on this site are the copyright of Simon Abrahams. To use copyrighted material in print or other media for purposes beyond 'fair use', you must obtain permission from the copyright owner. Websites may link to this page without permission (please do) but may not reproduce the material on their own site without crediting Simon Abrahams and EPPH.